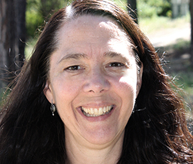 Jeannette Angel is a PhD candidate in the Interdisciplinary Graduate Studies program at UBCO. Her research focus is media for social change as a method of engaging the local Okanagan community in dialogue and action around environmental issues. Recent interdisciplinary projects include developing a curriculum based organic art garden at L’Anse au Sable, a French language school in Kelowna, British Columbia and initiating an art and movement French language program in Port Townsend, Washington. Jeannette has a Bachelor of Fine Arts from Concordia University in Montreal; a Master’s in Art History from the University of Washington in Seattle and has trained as professional dancer with the Royal Winnipeg Ballet and Contemporary Dancers in Winnipeg. She has performed and taught in Canada, the United States and France.